How to download and install WinSCP on Windows computers? 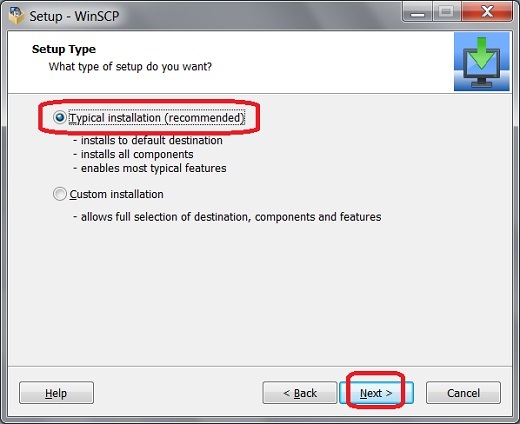 You can follow these steps to download and install WinSCP on your Windows computers. 1. Go to WinSCP Website. 2. Click the "DOWNLOAD NOW" button. You see the WinSCP download page showing up. 3. Click the large "DOWNLOAD WINSCP 5.13.4" button. You see the "WinSCP-5.13.4-Setup.exe" download prompt showing up. 4. Save "WinSCP-5.13.4-Setup.exe" to a temporary folder, and wait for the download to finish. 5. Double-click "WinSCP-5.13.4-Setup.exe" in the temporary folder. You see the WinSCP Server installation screen showing up. 6. Take the default configuration and finish the installation. ⇐ What Is WinSCP FTP Client?